We knew the show was happening, but weren’t really planning on going as it was a Sunday night. 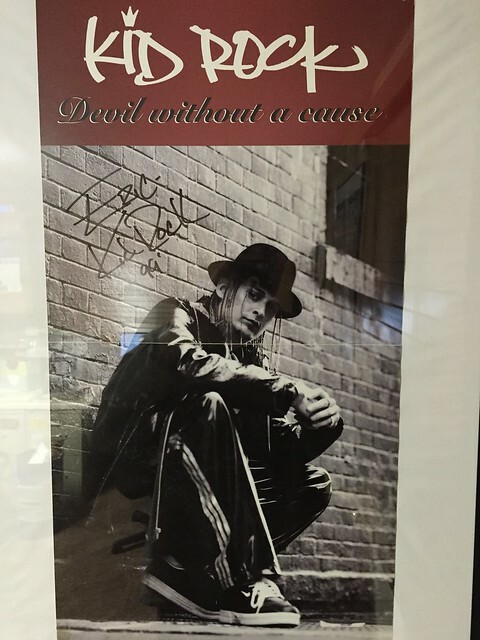 Kid Rock did a signing at the House of Guitars earlier in the day, so I went for the hell of it, and got a pretty sweet personalized autographed poster. Considering it was only 8 bucks a ticket, Mary and I decided we’d go after all, and I’m really glad we did! So after being blown away by a band we didn’t even know was on the bill until day of, we got to see Kid Rock! I’d also seen him prior, stopping for about two seconds to watch him at Warped Tour the preceding summer. Fast-forwarding to the time of this show, “Welcome 2 The Party” had done nothing as a single, but “I Am The Bullgod” was finally getting the album some attention. “Bawitdaba” was two weeks away from being released as a single, so at this point Kid hadn’t had the big mainstream success yet. It didn’t matter, as I remember the place being rather full. Rock and the band sounded fantastic. I have no idea what he played or in what order, but I do remember being super-impressed with him and the band. 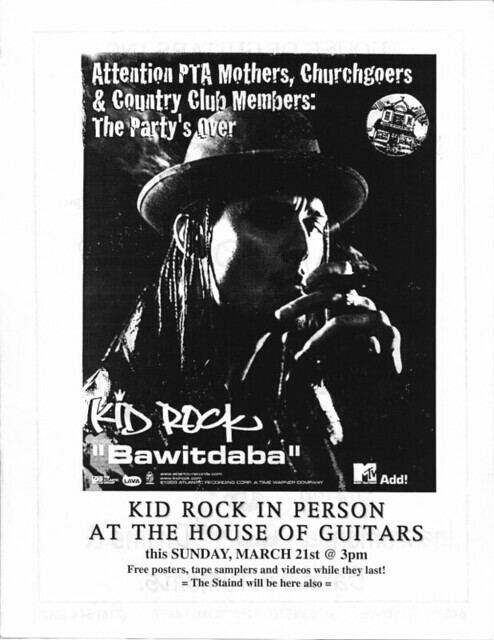 At one point, someone tossed a beer bottle right at Kid Rock up on stage, hitting his guitar, and he looked on the verge of jumping off the stage to fight whoever did it. Unfortunately, Joe C was sick on this night, and didn’t perform, so I never did get to see him live. But all the articles about Rock are true, he has always put on a high-quality show, no matter how small the venue or the crowd. I subsequently found out that there’s a live version of “Wasting Time” off of the German “Only God Knows Why” single that was recorded at this show!